A week after announcing a test of driverless cars that bring online grocery customers to its stores, Walmart has unveiled a pilot of robotic technology that brings products to its in-store personal shoppers. Walmart on Friday said it has partnered with North Billerica, Mass.-based automation specialist Alert Innovation on a test of its Alphabot robot to help fill online grocery orders faster. 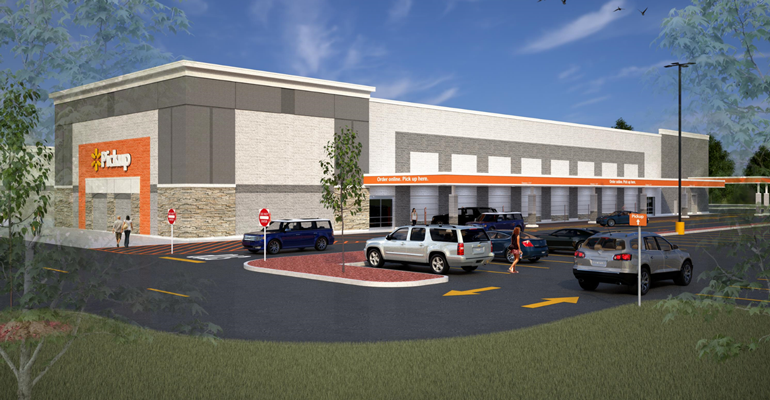 The automated storage and retrieval system, developed for Walmart, is being installed at the retailer’s supercenter in Salem, N.H. According to Mark Ibbotson, executive vice president of central operations for Walmart U.S., the technology represents “first of its kind” automation. Walmart is adding a 20,000-square-foot extension to the Salem store to house the Alphabot system, warehouse online grocery orders and serve as a pickup point, with drive-through lanes for customers. When the project is finished, automated mobile carts will retrieve ordered items and ferry them to personal shoppers at one of four pick stations. The associates then will pick, assemble and deliver the orders to customers. “The vast majority of grocery products we offer in-store will be fulfilled through this system, though our personal shoppers will still hand-pick produce and other fresh items,” Ibbotson noted. Plans call for Walmart to have the Alphabot system online and running by the year’s end. At the Salem supercenter, online grocery pickup service is slated to launch on Oct. 1, with delivery of online orders due to follow in the coming months. The remodel of the Salem store also will include Walmart’s Pickup Towers for online orders; an automated shelf-scanner that helps identify out-of-stock items, incorrect pricing and missing labels; and the company’s FAST unloader system to get products onto the salesfloor quicker. Later this year, the store is expected to launch Walmart’s Check Out With Me on-the-spot customer checkout service. Late last month, Walmart said it has teamed up with Waymo — formerly Google’s self-driving car project — to pilot an online grocery service in which autonomous vehicles pick up customers at their homes and take them to the store to collect their orders. Through the service, now being tested in Chandler, Ariz., customers order their groceries at Walmart.com/grocery, select online grocery pickup and designated a pickup time. Personal shoppers gather the items ordered. The Waymo car then picks up customers, brings them to the selected store to get their groceries, and then drives them home.